When we remove one of these, we can prevent or stop the progression of autoimmune disease. Obviously, we can’t change our genes, but we can address our triggers and intestinal permeability! I always come back to this simple– yet powerful – concept whenever I am helping someone discover their root causes. It illustrates how each and every one of us suffering from thyroid symptoms has the ability to get better. Our genes are not our destiny. I continue to find that incredibly empowering. And it is supported by science (which is important for a researcher like me). The issues of triggers and intestinal permeability are the focus of much of my books, Hashimoto’s Root Cause and Hashimoto’s Protocol. In my book, I walk through the steps that each person needs to take to remove the most common Hashimoto’s triggers, such as food sensitivities (gluten and dairy are the top culprits), chronic infections, stress, and environmental toxins. I also detail the importance of good liver support and take readers through steps to heal their nutrient deficiencies and intestinal permeability issues. Many of those who have followed my protocols have reported success with improving their health. For example, in my 2015 survey of 2,232 people having Hashimoto’s, 86 percent of people surveyed who had gone gluten free reported improvements in their digestive symptoms! While most people will see substantial improvements as they identify and remove their triggers, some people may still struggle and need to dig deeper to determine additional “hidden” triggers for them. After working with thousands of clients, I have found that one common “hidden” trigger that may elude many people is the other medications they may take for non-thyroid conditions. As a pharmacist. I was already well aware that many medications produced drug interactions with externally taken thyroid hormones. Given the importance of dosing when it comes to the effectiveness of thyroid hormone treatment, even slight alterations in the absorption of medications could impact the effect of thyroid hormones! As a medication safety pharmacist, I was also hyper-focused on any and all emerging research relating to how adverse drug reactions directly harm the thyroid in other ways. I came across a few surprises. Along with identifying a list of commonly prescribed medications that caused problems such as hidden thyroid triggers, I learned about the significant potential for ill effects that fluoride has on thyroid health (as well as the fact that many seemingly innocent medications contain fluoride!). So, as you look to find your hidden triggers, you need to ask yourself if the medications you take could be a trigger for your thyroid dysfunction. Remember Dr. Fasano’s concept: if you can remove the triggers for your thyroid dysfunction, you can heal yourself. A good place to begin is to think about what other health issues you may have and whether you take medication for these issues or not. This is important for a number of reasons. First, many other disorders, especially gastrointestinal disorders (such as undiagnosed celiac disease, atrophic gastritis, lactose intolerance, malabsorption in the small intestine, and Helicobacter pylori infections) may impede the absorption of thyroid hormones (such as levothyroxine) you may have been prescribed. Second, the medications you may be taking for these additional health issues could themselves affect the absorption of your thyroid hormones. Thyroid medications are referred to as “goldilocks” hormones, which mean that they have a narrow therapeutic index. They are dosed in micrograms (1/1000th of a milligram), and very slight changes in doses (such as what happens if absorption is affected) can lead to symptoms due to under-treatment or over-treatment. Third, along with affecting hormone absorption, medications for other health conditions beyond your thyroid may have a direct effect on the health of your thyroid in other ways. Some have been found to destroy thyroid cells and tissue, impact natural thyroid hormone production and even affect the immune processes of the thyroid gland. Other medications have been found to trigger Hashimoto’s. Some medications may also contain fillers that you may have food sensitivities to (such as lactose or perhaps gluten), or may contain chemicals that can directly impact your thyroid. Finally, thyroid medications can in turn impact the effectiveness and toxicity profile of other medications. This is one reason that, as a pharmacist, I always recommend you fill all of your prescriptions at the same pharmacy so your pharmacist can do a check of possible drug interactions every time you fill a new prescription. You can download a copy of my eBook, Optimizing Thyroid Medications, to learn more about common drug interactions that can lead to impaired thyroid hormone absorption. Lithium is still a widely used drug in internal medicine and psychiatry, and has been used for decades as a mood stabilizer for those with bipolar disorder, major depression and suicidal ideation. Lithium is prescribed in the U.S. as a generic drug (Lithium Citrate or Lithium Carbonate) or under the brand names Lithobid, Eskalith and Lithate. Lithium Citrate and Lithium Carbonate have been approved by the U.S. Food and Drug Administration (FDA). Lithium Orotate has not gained FDA approval, but can be found marketed online. So why is Lithium a problem? Lithium is accumulated at highly concentrated levels in the thyroid gland (at 3 to 4-fold higher concentrations as compared to its plasma levels). It has been found to inhibit synthesis and release of thyroid hormones, and may lead to increased destruction of thyroid cells. Lithium therapy side effects include goiters and hypothyroidism. It may also induce an increased risk of thyroid autoimmunity in susceptible individuals, as well as potentially lead to increased destruction of thyroid cells. In research published in 2000 summarizing available findings, hypothyroidism and subclinical hypothyroidism had been reported in 5 to 20 percent and as high as 50 percent of people taking lithium carbonate. Other studies have also validated these and other thyroid effects. In a 2014 study, lithium treatment in adolescents was associated with a significant increase in blood TSH levels. Should you consider beginning Lithium treatment for depression? First, talk with your doctor about whether your depression could be caused by issues with your thyroid! Depression and anxiety are common thyroid symptoms. I have found that after fatigue and weight gain, mood alterations such as these are the most common symptoms in people with Hashimoto’s. Hashimoto’s causes a breakdown of the thyroid gland, which can cause thyroid hormones to be dumped into the bloodstream, leading to transient hyperthyroidism. Symptoms of agitation, anxiety, and even psychosis can occur. Some patients have been misdiagnosed (even hospitalized) with “bipolar disorder” or “schizophrenia” when in fact they were suffering from thyroid imbalances. While I didn’t suffer from bipolar disorder, I battled with depression before my Hashimoto’s diagnosis. It is a very real concern, and you can read more about it here. Progressive psychiatrists will test patients that present with new onset depression, anxiety and other mental health conditions for thyroid disorders and may be open to initially prescribing thyroid medication. Even if their recommendation still calls for Lithium, it is important that you obtain baseline information on thyroid function with a full thyroid blood test panel (TSH, TPO antibodies, Thyroglobulin antibodies, and TSH receptor antibodies) and that you are checked on a regular basis once you begin Lithium treatment. You may also want to use thyroid ultrasonography to evaluate goiter development. Nutritional lithium known as lithium orotate, when used in small doses of 5-40 mg, may be a safer option that can provide mood stabilizing benefits for people with thyroid disorders. I recommend reading Nutritional Lithium – A Cinderella Story: The Untold Tale of a Mineral That Transforms Lives and Heals the Brain for more information about nutritional lithium. You may want to discuss this research with your physician to ensure they are aware of the information. Amiodarone is a potent anti-arrhythmic medication commonly used for heart disease conditions such as atrial fibrillation and is one of the most commonly prescribed anti-arrhythmic medications in North America. It is estimated that atrial fibrillation will affect more than 10 million patients in the United States by 2050. Amiodarone is used to help keep the heart beating normally in patients who have this condition. Because of the drug’s many known side effects, it is only used when other medications have failed in treating this type of life-threatening disorder. The drug is an iodine-rich compound that accumulates in several organs, including the lungs and thyroid. In the lungs, use of amiodarone has been associated with pulmonary toxicity.It has also been shown to have a profound impact on thyroid physiology and dysfunction. Due to its iodine-rich nature, amiodarone can cause iodine overload up to 50-100 times the optimal daily intake. No, that isn’t a typo! Amiodarone-induced thyroid disease has been estimated to occur in 2 to 24 percent of people who take it. The ill effects on the thyroid range from abnormal thyroid function test findings to overt thyroid dysfunction, with hypothyroidism resulting more commonly than hyperthyroidism. Both conditions can develop in normal thyroid glands or in glands with preexisting abnormalities. Hypothyroidism is reported in 6 to 10 percent of patients receiving amiodarone. Even when amiodarone medication is stopped, levothyroxine replacement is often still necessary. Amiodarone-induced thyrotoxicosis (a form of hyperthyroidism) develops in 3 percent of amiodarone-treated patients in North America. For those living in iodine-depleted areas, the incidence is even higher (10 percent). Two types of amiodarone-induced hyperthyroidism have been identified. Type 1 is a Graves disease-like hyperthyroidism characterized by the presence of antithyroid antibodies. Type 2 produces no antithyroid antibodies, but creates a direct toxic effect on the gland, causing it to dump thyroid hormone into circulation. Baseline thyroid function tests should be performed in all cardiac patients to exclude underlying thyroid gland dysfunction that may predispose an individual to hypo- or hyperthyroidism after amiodarone therapy is started. Subsequent thyroid testing should be done, including ongoing follow-ups to monitor serum TSH concentrations and thyroid antibodies. Note that there is a replacement drug, Dronedarone (brand name is Multaq), that has been approved as an anti-arrhythmic drug and appears to share the pharmacological actions of amiodarone without having the iodine component that causes the multiple organ toxicities. However, this drug is being reviewed by the FDA relating to reports that it increases the risk of cardiovascular death and heart failure in patients with permanent atrial fibrillation. It may be something you want to discuss with your doctor. Fluoride is found in many communities in public water (as fluoridation to promote fewer cavities), is in some toothpaste, is often used in dental treatments, and is found in bottled beverages and a large variety of medications as a filler. According to the Center for Disease Control’s 2014 analysis on fluoridation, 74.4 percent of the US population getting their water through community water systems was receiving fluoridated water. Given all of that, you might be surprised to learn that fluoride is toxic to thyroid function! Fluoride was actually used to treat hyperthyroidism up until the 1950’s, prior to the development of other thyroid-suppressing medications. It is effective as a thyroid suppressor at doses of 0.9-4.2 mg per day for hyperthyroidism. If most adults in fluoridated communities are ingesting between 1.6 and 6.6 mg of fluoride per day from their drinking water, that’s more than enough to suppress their thyroid function! You can read an article I previously wrote on fluoride and your thyroid health here, which contains a good deal of research references. There are several additional studies focused on fluoride’s effect on the thyroid. In one very large observational study in England, researchers looked at the 2012 levels of fluoride in the community drinking water supplies throughout the country. They then evaluated the prevalence of underactive thyroid in regions both having fluoridation as well as those that did not have fluoridation. Reported thyroid cases were those diagnosed by a large population of family doctors throughout the country. Areas with water fluoridation were linked to a 30 percent higher rate of underactive thyroid. In another study focused on the effects of fluoridation on the thyroids of children, it was observed that high fluoride exposure can cause functional abnormalities of the thyroid. Researchers found that the TSH output from the pituitary gland is inhibited by fluoride, reducing thyroid hormone output from the glands. Further research indicates that fluoride may act as a trigger in inducing thyroid cell death and inflammation. Its usage can lead to the development of thyroiditis and autoimmune thyroiditis. With my clients and readers, I have seen some people report improvement in thyroid symptoms and thyroid function tests following the removal of fluoride from their lifestyle. Fluoride-containing medications include antacids, appetite suppressants, anti-anxiety medications, antibiotics, antidepressants, antihistamines, cholesterol-lowering medications, anti-malarial medications, anesthetics, chemotherapy medications, arthritis medications, psychotropic medications, antifungals and steroids. You can check this site for a full list of medications containing fluoride. To remove fluoride, you have to know where to find it! It can be found in some medications and supplements, canned foods, chewing tobacco, toothpaste, teas (especially the black and red varieties), dental treatments, and water (in fluoridated communities). Bottled water isn’t a safe go-to either since some contain fluoride (see http://fluoridealert.org/content/bottled-water/ for more information). You can also utilize supplements to help recover from long term fluoride use. A recent study done with rats has shown that taurine, a major constituent of bile, can partially alleviate thyroid dysfunction caused by fluoride! Taurine and other bile boosting ingredients can be found in the Rootcology Liver & Gallbladder Support. Oral estrogens, such as those taken for birth control or hormone replacement therapy, cause an increase in thyroxine-binding globulin (TBG). TBG binds thyroid hormone. More circulating TBG leads to lower levels of free thyroid hormone available for use by the body. Women starting estrogen may find an elevation of their TSH level, and dose adjustments to their thyroid hormone medication may be necessary. Oral contraceptives can also cause an excess of estrogen referred to as estrogen dominance, which, along with mood swings, hormone imbalances and weight gain, can increase inflammation and worsen hypothyroid symptoms. It can even trigger autoimmune conditions. You can read more about how hormone imbalances can be a trigger for Hashimoto’s here. Birth control pills can also deplete selenium, zinc and the amino acid tyrosine which are all necessary for proper thyroid function. Check out more about this in the book Drug Muggers by Suzy Cohen, RPh, America’s Pharmacist. Another trigger relating to some oral contraceptives is the fillers that can be found in the pills. For example, many contain lactose. This may be an additional issue for women with Hashimoto’s (who often present with dairy and gluten intolerance issues). It was definitely a hidden trigger for me! Oral contraceptives have many other health considerations beyond your thyroid. Other health issues such as increased risk of blood clots and strokes, osteoporosis, changes to our natural flora (allowing yeast and other pathogenic organisms to flourish), and more. You should discuss these issues, along with your thyroid concerns, with your physician. As I mentioned earlier, birth control pills were one of my hidden triggers, and I also wanted to find a healthier– yet highly reliable– option. I love the Lady-Comp and Daisy Fertility Monitors. You can read more about them as well as the Fertility Awareness Method, if you are interested. Of course, there may be medical reasons why a woman may need to continue taking oral contraceptives. In that case, it is important that you have regular monitoring of your thyroid function and medication dosage, and it is even more important to supplement with probiotics, magnesium, zinc, B vitamins and Vitamin C.
These days, many people are taking Proton Pump Inhibitors (PPI therapy) to address acid reflux (gastroesophageal reflux disease or GERD), peptic ulcers and indigestion. They are the most common “acid blockers”. In 2008, Americans spent $14.1 billion on these types of drugs. In 2014, Americans filled more than 170 million prescriptions for acid blockers. When I was initially symptomatic, I had incredible acid reflux issues. I had tried a variety of the popular proton pump inhibitors (Prilosec, Aciphex and Nexium), Pepcid, Tums and Pepto Bismol… nothing worked. I drank gallons of milk and bottles of Mylanta trying to soothe the burning, choking sensation. I avoided all sorts of “acidic” foods such as oranges, tomato sauces and red wine. And then I found my trigger- something I had been consuming for years without knowing it was the root of my digestive troubles. Finally, I had an IgA food intolerance test that showed me what the culprit of my acid reflux issues was: dairy! After giving up dairy, I no longer had acid reflux symptoms and no longer had to take any of my acid suppressing medications. It was only then that I learned about the many negatives associated with thyroid health and taking PPIs and similar over-the-counter medications. I also learned that acid reflux symptoms are very common in people having Hashimoto’s. Even more important, my research pointed out that the issue for people having Hashimoto’s wasn’t their having too much acid! The reality is that most people with Hashimoto’s have too little or even no stomach acid. Low stomach acid can have the same symptoms as acid reflux. And guess what? Acid-suppressing medications made the symptoms worse and did nothing to remove the underlying root cause (in my case, my food sensitivity to dairy). The bulk of evidence suggests that PPIs reduce levothyroxine absorption. Research has found that patients with impaired gastric secretion required a higher dosage of thyroxine. Other research showed that patients with hypothyroidism and normal TSH values during levothyroxine replacement therapy may need additional thyroid function testing after treatment with PPIs and may need adjustment of their levothyroxine dose. With clients and readers, and in my research, I have consistently found medications and supplements that suppress stomach acid may cause impaired absorption of thyroid hormones, and that includes the above proton pump inhibitors, as well as antacids, calcium, magnesium-aluminum and iron. For that reason, I always recommend spacing out calcium, iron and magnesium supplements by at least 4 hours from thyroid medications. I also recommend a careful re-evaluation of the use of acid-suppressing medications in everyone with Hashimoto’s and hypothyroidism. I suggest looking for the actual trigger for the acid reflux symptoms, which is often a food sensitivity or infection. It’s especially important to look at common food sensitivities such as dairy and gluten to see if that resolves the acid problem. If not, I have found the Alletess IgG Food Sensitivity Test to be highly reliable for identifying acid reflux inducing foods. One can test for H-pylori which can also cause acid reflux symptoms and be a hidden trigger for you. Low stomach acid, again, is common in people having Hashimoto’s. Plus, having low or no stomach acid puts people at a greater risk for many health issues such as contracting parasites from our food, developing food sensitivities, developing small intestinal bacterial overgrowth (SIBO), and developing nutrient depletions. Betaine with Pepsin can also be helpful to re-acidify gastric pH. In my May 2015 survey of 2232 people with Hashimoto’s, out of 627 people who took Betaine HCl and Pepsin, 59 percent of people said that it made them feel better. To learn more about Betaine with Pepsin and other interventions that can help you if you have acid reflux or other digestive issues, you can start with this article. Some of my clients and readers with low stomach acid have also found that taking thyroid medications with hot lemon water (the juice of one lemon in a glass of water) or with apple cider vinegar (one teaspoon per 8 oz. glass of water) can help provide enough acidity to aid with the absorption of their thyroid hormones. This medication is used to treat a wide variety of cancers (including melanoma, leukemia and AIDS-related sarcoma) and is also a treatment for a number of viral infections (chronic hepatitis C, chronic hepatitis B, condylomata acuminate). Interferons are thought to work by boosting the body’s immune system response to reduce either the growth of cancer cells or help the body fight off virus infections. They do not kill cancerous or viral cells, but regulate the action of specific genes that control the production of cellular proteins that affect cell growth. They “interfere”, if you will, with the targeted (dangerous) cells. Interferons (IFN) used therapeutically are manufactured using recombinant DNA technology and come in a variety of classes (alpha/α, beta/β and gamma/γ). All of these classes have antiviral properties, and there is a wide assortment of generics and brands available. The different classes are used for varied disease treatments and have their own known benefits as well as side effects. IFN-α (alpha) forms are widely used in the treatment of chronic hepatitis C virus (HCV) infections and some forms of cancer. IFN-β (beta) treatment has been used primarily to treat multiple sclerosis (MS). IFN-γ (gamma) has been approved for use in a rare congenital disorder, chronic granulomatous disease. By far, one of the most frequent applications of interferon is against chronic HCV infections, for which IFN-α has been an approved treatment since 1991. As per the World Health Organization (WHO), nearly 3 percent of the global population suffers from Hepatitis C Virus (HCV) infection. The importance of interferon therapy for this disorder is emphasized by the fact that 1.5–2.2 percent of Western populations are positive for HCV, and HCV infection is a potentially life-threatening disease. 75 percent of affected patients with acute infection develop chronic disease with a high risk of cirrhosis and hepatocellular carcinoma. Common brand names for IFN-α medications are Alferon N, Intron A, Pegasys, PegIntron, Sylatron and Roferon-A. While providing beneficial results in most cases, thyroid disease has been primarily reported due to treatment based on Interferon Alfa A (IFN-α). The prevalence of thyroid abnormalities during interferon therapy ranges from 2.5 to 20 percent. Interferon-induced thyroiditis (IIT) is a major clinical problem for patients who receive IFN therapy. Hypothyroidism is more common (40-50 percent of patients) than hyperthyroidism (10-30 percent of patients). Always discuss available research like this with your doctor. He/she should be monitoring your thyroid levels while on interferon, regardless of whether or not you are currently taking thyroid hormone medication. Symptoms of thyroid dysfunction may be absent or occur as early as 6 to 8 weeks after starting therapy, or be delayed until after 6 to 23 months of receiving therapy. For many patients taking interferon, thyroid dysfunction seems to be transient and has been shown to resolve itself after patients stop interferon therapy. If you weren’t already on levothyroxine treatment, you may need to be in order to alleviate hypothyroid symptoms. This is a brand name medication which was used for serious skin conditions such as cystic acne. The generic drug is isotretinoin, which is sometimes also referred to as 13-cis retinoic acid. It is a naturally occurring derivative of vitamin A. Accutane was marketed to reduce the amount of oil released by the oil glands in your skin, and that is how the generic works as well. There are many known side effects, some quite serious such as birth defects (if taken by pregnant women), mood disorders, digestive issues, and more. In June 2009, Roche Pharmaceuticals pulled Accutane from the US market due to both increased competition from generics as well as increasing liability from personal-injury lawsuits. The product had been the subject of many claims relating to irritable bowel disease as a side effect. Today, a variety of generics and brands of isotretinoin can be purchased, either through prescription or online. Online, vendors still market “Accutane” and Accutane look-alikes. Some brands available today include: Absorica, Myorisan, Amnesteem, Claravis, Roaccutane and Zenatane. While there isn’t a lot of specific research on isotretinoin’s potential effects on the thyroid, there have been enough questions raised – and a number of documented case studies – about potential side effects that you should at least be aware of. Additionally, please do your research on ALL of the ill effects of this drug! It’s important for everyone but especially for women who may become pregnant. In the US, there is in fact an FDA-mandated program called iPLEDGE where dermatologists who prescribe isotretinoin must register individual patients using the prescription. This is primarily focused on women with childbearing potential due to the significant risks involved. Much of the research that does exist on isotretinoin has been focused on other side effects such as birth defects, depression, etc. There have also been a few studies focused on the medication’s effects relating to autoimmune diseases, including thyroiditis, as well as diabetes and autoimmune hepatitis, in genetically-susceptible individuals. Those few studies have found that isotretinoin treatment caused significant increases in TSH levels, but further evaluation was deemed necessary relating to whether the drug may play a role in triggering autoimmunities, such as Hashimoto’s, in genetically susceptible individuals. As already mentioned, there are numerous ill effects associated with use of isotretinoin. 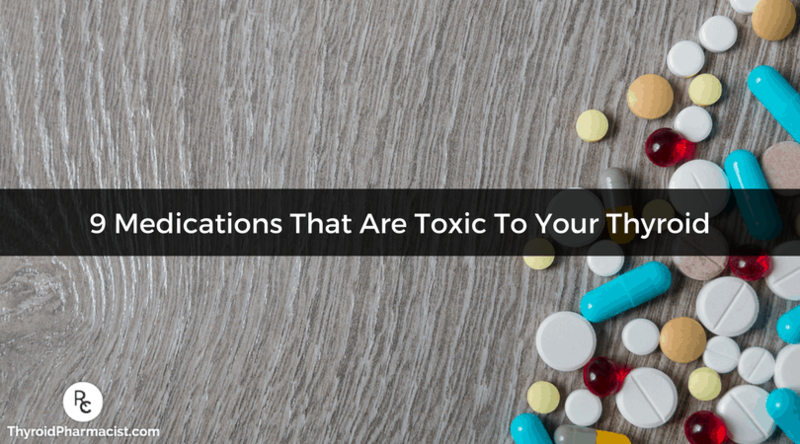 Impact to your thyroid should be considered one potential issue, but frankly, there are so many others that you should avoid this drug in most cases. My suggestion for acne issues starts with removing triggers such as food sensitivities, toxins, and endocrine disruptors, and improving gut health. In my book, Hashimoto’s Protocol, I go through a step-by-step approach to doing this, prioritized in a such a way that most people start to feel better fairly quickly. Many people will see improvements in their skin by implementing these lifestyle changes. If you have Hashimoto’s, you need to be even more careful than other people in regards to “chemicals” you apply to your body or take into your body. I wrote an article on beauty products, focusing specifically on how detrimental some can be to your health. If you’ve been doing any research at all on thyroid disease, you know that iodine is a critical nutrient for thyroid health. Iodine deficiency in some parts of the world is the primary reason for hypothyroidism. Iodine excess, on the other hand, can be a risk factor for developing Hashimoto’s in people who are genetically predisposed to Hashimoto’s and who may have certain co-occurring vulnerabilities like a selenium deficiency. Another vulnerability could be intestinal permeability (leaky gut). Studies have shown that excess iodine causes thyroid injury by generating reactive oxygen species, which lead to premature damage and programmed cell death in thyroid tissues. These iodine-overloaded cells can then turn on the autoimmune process in a person with the right genetic predisposition and intestinal permeability. I have seen many people harmed by a high dosage of iodine. Yes, they may initially feel great. But then they feel worse… much worse in most cases. Taking a high dose of iodine can exacerbate Hashimoto’s and accelerate thyroid cell destruction. The American Thyroid Association cautions against using doses of more than 500 mcg per day in the general public and noted that doses above 1100 mcg may cause thyroid dysfunction. These warnings are for the general population, but studies have found that people with Hashimoto’s may be sensitive to even smaller doses. In some cases, a low iodine diet has been helpful in reducing the autoimmune attack on the thyroid gland and in normalizing thyroid function in people with iodine-induced Hashimoto’s. For more information about the low iodine approach, please see my first book Hashimoto’s Thyroiditis: Lifestyle Interventions for Finding and Treating the Root Cause. Iodine is a complicated topic, so please refer to an earlier article I wrote, which was focused on iodine. This article includes more research information, as well as the results of my Root Cause Rebels survey on using iodine versus using selenium. Find out which intervention had the greatest effect. You might be surprised! To summarize… although iodine serves as fuel for our thyroid and is very important in iodine deficiency induced hypothyroidism, Hashimoto’s is a different mechanism. Adding iodine is like pouring gas into an engine that’s on fire… that’s essentially what’s happening in Hashimoto’s. Adding iodine to the mix before putting out the fire and fixing the engine may result in further damage to the thyroid. In those with a predisposition to autoimmunity, this has been documented time and time again, in both animal and human studies. My approach is, let’s fix the engine first (usually a gut issue), and then add the fuel once we know that the engine is no longer on fire. Please read the article linked above and also check out my book, Hashimoto’s: Root Cause. I have an entire chapter on the iodine controversy that references numerous studies. One of my friends, a functional medicine nutritionist, noticed that for some women, the popular wrinkle reducing cosmetic procedure “botox” can bring on or exacerbate Hashimoto’s. Botox is a brand name for the Botulinum toxin. Note the word toxin in its name! The Botulinum toxin (type A is for treating frown lines) was approved by the FDA in 2002. Since then, its injection has become one of the most common cosmetic procedures. But, there have been many concerns raised about potential side-effects. Botulinum toxins are among the most toxic poisons known to humans, with a lethal dose of approximately 1 ng per kilogram body weight. There are seven serologically distinct types of botulinum toxins. Botulinum toxin A (used in cosmetics treatments) is the most potent serotype, with a toxicity one million-fold higher than cobra toxin and far higher than cyanide! Yet, we somehow decided it was a good idea to inject it into our skin for strictly cosmetic purposes. In one case study, it was concluded that a possible pathogenetic link existed between Clostridium botulinum neurotoxin A (Btx) and autoimmune thyroid diseases. The authors noted that given the many people suffering from subclinical thyroid disease without knowing it, and so many people using Btx, thyroid complications may be frequently passing undetected. While there is benefit to using botulinum for specific medical purposes (for example, it can be used to address upper lid retraction issues associated with thyroid eye disease), I do not recommend its use for cosmetic purposes. I view botox as a foreign body – a toxic one at that – that you are putting into your body. Read the scary 22 page manufacturer’s booklet, which contains mainly a series of warnings and cautions! People with Hashimoto’s need to be especially cautious about toxins, as they are usually triggers for symptoms. Certain medications that can increase clearance of thyroid hormones by the liver, such as rifampin, phenytoin, carbamazepine and a class of medications known as barbiturates (a common one being phenobarbital). These can be impactful to people taking hormone medications (you may need to increase the dosage). The important point here is to realize that you should always discuss any new medication with a knowledgeable health care professional such as your physician or pharmacist (who knows ALL of your medications and health issues). And take charge of your healthcare. Ask questions. Do your own research. And, don’t forget to ask questions relating to fillers. If you have dairy or gluten sensitivities, you don’t want even a supposedly “thyroid-friendly” medication that has dairy or gluten fillers. Just like I experienced issues with lactose fillers, there has been research on this topic that shows how impactful this can be. I hope you have learned a few things that will help you in your journey to feel better. I know that the information in this article may seem overwhelming, as there are so many diseases, medications, toxins, triggers, and more that can affect your Hashimoto’s, your well being, and generally how you feel. But, take it slow and continue to focus on discovering your root cause. And, for support and encouragement along the way, join my community if you haven’t already! Sign up for my newsletter to have helpful information delivered right to your email inbox. And join me on Facebook, too. We’re all in this together. Kraszewska A, Abramowicz M, Chłopocka-Woźniak M, et al. The effect of lithium on thyroid function in patients with bipolar disorder. Psychiatr Pol. 2014;48(3):417-28. Kibirige D, Luzinda K, Ssekitoleko R. Spectrum of lithium induced thyroid abnormalities: a current perspective. Thyroid Research. 2013;6:3. doi.org/10.1186/1756-6614-6-3. Dong B. How medications affect thyroid function. West j Med. 2000;172(2): 102–106. Wolkove N, Baltzan M. Amiodarone pulmonary toxicity. Can Respir J. 2009;16(2): 43–48. Shah S, Shah M. Is dronedarone really safe than amiodarone? Indian J Pharmacol. 2012; 44(6): 805–806. doi: 10.4103/0253-7613.103308. Piga M, Serra A, Boj F, et al. Amiodarone-induced thyrotoxicosis. A review.Minerva Endocrinol. 2008;33(3):213-28. Tsang W, Houlden R. Amiodarone-induced thyrotoxicosis: a review. Can J Cardiol. 2009; 25(7): 421–424. Narayana S, Woods D, Boos C. Management of amiodarone-related thyroid problems. Ther Adv Endocrinol Metab. 2011; 2(3):115–126.doi: 10.1177/2042018811398516. Shah S, Shah M. Is dronedarone really safe than amiodarone? Indian J Pharmacol. 2012; 44(6):805–806. doi: 10.4103/0253-7613.103308. CDC. 2014 Water Fluoridation Statistics. Centers for Disease Control and Prevention.Available at https://www.cdc.gov/fluoridation/statistics/2014stats.htm. Published 2014. Updated August 19, 2016. Accessed January 6, 2018. Peckham S, Lowery D, Spencer S. Are fluoride levels in drinking water associated with hypothyroidism prevalence in England? A large observational study of GP practice data and fluoride levels in drinking water. J Epidemiol Community Health 2015;69:619-624. http://dx.doi.org/10.1136/jech-2014-204971. Singh N, Verma KG, Verma P, Sidhu GK, Sachdeva S. A comparative study of fluoride ingestion levels, serum thyroid hormone & TSH level derangements, dental fluorosis status among school children from endemic and non-endemic fluorosis areas. SpringerPlus. 2014;3:7. doi:10.1186/2193-1801-3-7. Adedara I, Ojuade T, Olabiyi B], et al. Taurine ameliorates renal oxidative damage and thyroid dysfunction in rats chronically exposed to fluoride. Biol Trace Elem Res. 2017;175(2):388-395. doi: 10.1007/s12011-016-0784-2. IMS Health Reports U.S. Prescription Sales Grew 3.8 Percent in 2007, to $286.5 Billion. BusinessWire. https://www.businesswire.com/news/home/20080312005158/en/IMS-Health-Reports-U.S.-Prescription-Sales-Grew. Published March 12, 2008. Accessed January 7, 2018. Moyer M. Heartburn Meds Alter the Gut. Scientific American. https://www.scientificamerican.com/article/heartburn-meds-alter-the-gut/. Published May 1, 2016. Accessed January 7, 2018. Irving S, Vadiveloo T, Leese G. Drugs that interact with levothyroxine: an observational study Thyroid Epidemiology, Audit and Research Study (TEARS). Clin Endocrinol (Oxford). 2015;82(1):136-141. Liwanpo L, Hershman J. Conditions and drugs interfering with thyroxine absorption. Best Pract Res Clin Endocrinol Metab. 2009;23(6):781-792. Sachmechi I, Reich D, Aninyei M, et al. Effect of proton pump inhibitors on serum thyroid-stimulating hormone level in euthyroid patients treated with levothyroxine for hypothyroidism. Endocr Pract. 2007;13(4):345-9. Friedman RM. Clinical uses of interferons. British Journal of Clinical Pharmacology. 2008;65(2):158-162. doi:10.1111/j.1365-2125.2007.03055.x. Kesavachandran C, Haamann F, Nienhaus A. Frequency of thyroid dysfunction during interferon alpha treatment of single and combination therapy in hepatitis c virus-infected patients: a systematic review based analysis. PLOS. 2013. https://doi.org/10.1371/journal.pone.0055364. Tomer Y, Blackard JT, Akeno N. Interferon alpha treatment and thyroid dysfunction. Endocrinology and metabolism clinics of North America. 2007;36(4):1051-1066. doi:10.1016/j.ecl.2007.07.001. Dong B. How medications affect thyroid function. Western Journal of Medicine. 2000;172(2):102-106. Uvar B, Solak A, Saklamaz A, et al. effects of isotretinoin on the thyroid gland and thyroid function tests in acne patients: a preliminary study. Indian J Dermatol Venereol Leprol. 2016 Sep-Oct;82(5):587-8. doi: 10.4103/0378-6323.182794. Yıldırım N, Dogan S, Atakan N. Evaluation of thyroid function tests of acne vulgaris patients treated with systemic isotretinoin. J Dematolog Treat. 2017 Mar;28(2):141-144. doi: 10.1080/09546634.2016.1214232. Nugroho J, Schweiger B. Isotretinoin as a Possible Environmental Trigger to Autoimmunity in Genetically Susceptible Patients. Case Reports in Pediatrics. 2017;2017:4207656. doi:10.1155/2017/4207656. Contempre B, Dumont J, Ngo B, et al. Effect of selenium supplementation in hypothyroid subjects of an iodine and selenium deficient area: the possible danger of indiscriminate supplementation of iodine-deficient subjects with selenium. J Clin Endocrinol Metab. 1991;73(1):213-215. doi:10.1210/jcem-73-1-213. Gregoric E, Gregoric J, Guarneri F, et al. Injections of clostridium botulinum neurotoxin A may cause thyroid complications in predisposed persons based on molecular mimicry with thyroid autoantigens. Endocrine. 2011 Feb;39(1):41-7. doi: 10.1007/s12020-010-9410-9. Hi! Great article. I developed Hashimoto’s from dysport injections. I am convinced that’s what brought on my thyroid disease after receiving injections and feeling absolutely horrible afterwards. I considered getting more since I was not 100% sure that’s what caused it and after reading this I will not get any type of injectables. Thanks again! Joanna – thank you for sharing your journey. I am happy to hear you are taking charge of your health! Please keep me posted on your progress here. I would like to first thank you for such an informative blog. When I first had my thyroid problems, I felt so alone and hopeless. My doctors basically said “you’re going to have hypothyroidism no doubt. It is a matter of time until you’re thyroid gets completely ruined, and you should start taking the replacement hormone now and for life.” I refused to take the hormone because I had horrible unexplained palpitations, very fast and strong heart beats. I could not imagine how my palpitations would be like if I took the hormone. At the time the my TSH level were around 3.90. “borderline hypothyroidism” and I had very high levels of antibodies. I would sometimes wake up from my sleep because of my palpitations, I felt that my heart was about to jump out of my chest. My cardiologist did some test and examinations (holter…etc) nothing was wrong expect for apparent fast heart beats. He said that “as long as you don’t have any episodes of fainting then you don’t have an apparent heart problem”. Non of my docs ever recommended Selenuim or Magnesium. I was desperate when I came across your blog. I went to the pharmacy and got the selenium, my palpitations got better but still unbearable. I started reading about Magnesium on your blog and its positive impact on heart palpitations. I started using it for three days now and my life is not the way it was. I feel much better and my heart is much much better. I can’t thank you enough and God bless you. As always, very interesting stuff! I feel the need to read it several times over; is there a way to print out these articles so I can keep them in a binder? Simone – thank you for following this page. If you scroll to the bottom of the article there should be an image of a little printer on the left hand side. I hope that helps! Excellent information! Thank you so much! Judy – you are very welcome! I can’t use hair dye anymore ,my throat swells up and i can hardly breath . Linda – thank you following this page. Determining our individual root causes and avoiding the triggers that worsen our auto immune disease is a personal journey for each of us. I can tell you that I had an auto immune flare after trying a very popular hypo allergenic brand of make up and I have the labs to prove it! Some of us are more sensitive than others. Here is an article you may find helpful. ARE YOU SACRIFICING YOUR HEALTH FOR EXTERNAL BEAUTY? If iodine can accelerate thyroid cell destruction, would it be beneficial for a person who has had total thyroidectomy & I-131 abalation to help destroy possible metastasized thyroid cancer cells with it? Your articles are so easily readable, well documented and help uncover so many connections in health problems. You truly have a passion to help save others from the suffering you have endured. The fact that you give an abundant amount of information in your articles and websites for free is such a gift. The way you send articles every week and build up the components of understanding step by step is so helpful, especially for foggy brain Hashimoto patients. I have gained so much by your work. Thank you for blessing me!! Kim – thank you so much for your kind words and support! I hope you find these articles helpful as well. What an xcellent article with much food for thought. I’m on both levothyroxine and lansoprazole and will now discuss this with my doctor. Thank you Dr Isabella. What are your thoughts about Mycobacterium Avium subspecies Paratuberculosis (MAP)? Vegetarian diet might be essential…. Mary – thank you so much for your support! I highly recommend that you work with a functional medicine clinician. It’s an entire medical specialty dedicated to finding and treating underlying causes and prevention of serious chronic diseases, rather than disease symptoms. I love your articles and have your book on the root cause of Hashimotos. I have been feeling worse the last week or so and didn’t understand why. Then I got your email yesterday with the link to this article. There it was on #9 – Botox. I just had Botox two weeks ago. I’ve only done it once before prior to having Hashimoto’s and didn’t realize it could cause problems. So now I know, no more Botox for me! But what do I do meanwhile? Is there anyway to flush it out of my system? Hello and thank you for all of the information. I have spent years trying to reverse my Hashimotos and have done well, but this extremely restrictive lifestyle with food, products, medicines, etc. makes it seem impossible. Quality of life gets effected as well as trying to pay for all of these “organic” products (which is no guarantee). I can’t even afford a functional medicine doctor due to my grocery bill. My antibodies are down to 125, but I don’t think I can afford to get the rest of the way there. In the morning, half an hour after taking my medication for hypothyroidism, I often take a glass of water with half lemon squeezed in and a 1/4 tea spoon of bicarbonate. Does it have any impact on medication absorption? Thanks for this info. I had previously heard that some beta-blockers (e.g. propanolol) also disrupt thyroid. Do you think their effect is too mild to be included in this list? When you talk about botox, is there any evidence that hyraulonic facial fillers would have the same effect and be bad if you have Hashimotos? Lee – thank you for following this page. I wish I could give you more direct advice but, each person will react differently. I would advise you to ask your personal pharmacist or a trusted clinician who’s care you are under. I am not able to respond directly to these types of questions here. I have gone from severe suppressed hypothyroidism @ 175 synthroid ( happened quickly) to severe suppressed hyperthyroidism. Last reading was .002. Problem is that I now have no energy, severe weight gain, severe diarrhea, and a constant sore throat. They are keeping me on synthroid 100 even though im in severe hyperthyroidism . Confusing doctor and endocrinologist. I am always hot even with temperatures set at 64 degrees, i am burning up. With a rare occasional freezing where my body temp drops to severe shivering and I have to put layers of covers on over my head for long term to get heated them im frying again. This has been going on for almost a year and getting worse. I am beyond myself and do not understand the reverse reactions that people normally get. A step of guidance of who or what other doctor I could see? I have absolutely no energy what so ever. Any suggestions, thoughts would be gratefully received. Joyce – thank you for sharing you journey. My heart goes out to you. <3 I highly recommend that you work with a functional medicine clinician to be a part of your own health care team. It’s an entire medical specialty dedicated to finding and treating underlying root causes and prevent serious chronic disease rather than treating individual disease symptoms. People with Hashimoto’s may experience BOTH hypothyroid and hyperthyroid symptoms because as the thyroid cells are destroyed, stored hormones are released into the circulation causing a toxic level of thyroid hormone in the body, also known as thyrotoxicosis or Hashitoxicosis. Eventually, the stored thyroid may become depleted and due to thyroid cell damage, the person is no longer able to produce enough hormones. At this time, hypothyroidism develops. You are just a breath of fresh air I am so pleased I happened to come across your website I swallowed radio active iodine when I was 38 years of age as I had an very overactive thyroid I was told that I would have heart failure unless I swallowed it. they then proceeded to tell me that they had overdosed me with the second dose as their monitor wasn’t working properly. I have been on Oxine all these years except I took Armour Thyroid for a while. Drs are not allowed to write scripts for natural medicine in Australia. I came from sporting family and I was classed as the lazy one in the family- my mind was willing but my body wasn’t I didnt explain how I felt ás they were wll too busy with their own lives Since then I was diagnosed with CFS but after I read what you had been through I know now that it wasn’t all in my head. I don’t blame the Doctors I blame the AMA who are teaching our young doctors to keep the drugs comanpies in business. Once again thank you do much. June S.
June – thank you so much for sharing your journey! I understand how frustrating this can be. <3 Most thyroid conditions result from the immune system attacking the thyroid because the immune system is out of balance. Even when the thyroid is taken out surgically or treated with radioactive iodine the autoimmunity still persists in most cases. Many people will have their thyroids removed, and will develop new autoimmune disorders such as Lupus, Rheumatoid arthritis, etc. The immune system just finds a different target. I was diagnosed 3 years ago with Hashimoto’s and have been following your articles and suggestions, thank you so much! One question, I have read that you advise against Botox, which I understand. However, are there ANY fillers you would say are ok? I am 52 and my face seems to be “de-flating”! Would love a little touch up to look better but I am afraid to use anything without guidance, and I don’t really trust a cosmetic doctor to be honest with me about whether something is really ok with Hashimotos. I hate to think I have zero options. Would appreciate any thoughts, thanks. WTH! Fluoride in diflucan? Geez it’s all over my chart, no fluoride based drugs! Glad I read this today as I started a round 4 days ago. Is there a similar antifungal that doesn’t have fluoride? CSye – thank you so for reaching out. I understand how frustrating this can all be. <3 Here is an article you might find interesting. I see that you said “Glucocorticoid medications like prednisone, which can suppress TSH levels” – no kidding! That is exactly what I am going through. I was wrongly diagnosed with “asthma” 3 years ago and put on heavy glucocorticoid inhalers, etc. After harassing my doctors for years to admit that all my symptoms might be thyroid / adrenal related, they finally agreed to test my thyroid, but of course, he did only the TSH and T4 – result … “nothing wrong – imagination” – although TSH almost out of top range and T4 in middle! (Typical response from ignorant doctors). Docs refuse to believe its thyroid, even sent for x-rays heart and lungs – zero wrong. I have had the most horrible withdrawal symptoms weaning off of the glucocorticoids and it apparently can take up to a year to safely wean to avoid severe adrenal/hormone problems. After 4 months, am still on half dose. Been supporting withdrawal with good quality multivitamins, selenium, magnesium, B-vits, Ashwagandha, Vit D, at the same time. Still anxiety / panic attacks – use St Johns Wort & Passiflower has helped 70%. Had another test at this halfway point and now everything is “flat line” mid-range TSH, T4 and T3. Still feeling lousy (hair, nails, fatigue, dry skin, eyebrows, orthostatic intolerance, etc.) Some mood and fatigue changes for the better but they vary from day to day. I dont suppose there is any way in which to assess actual thyroid function until I am off the glucocorticoids? Testing Cortisol would also be useless? What would be other good supporting adrenal / thyroid supplements until then? Mel – thank you for reaching out and sharing your journey. I am so sorry you are struggling with all of this. <3 I highly recommend that you work with a functional medicine clinician to be a part of your own health care team. It’s an entire medical specialty dedicated to finding and treating underlying root causes and prevent serious chronic disease rather than treating individual disease symptoms. I believe that everyone needs to find a practitioner that will let him/her be a part of the healthcare team. You want someone that can guide you, that will also listen to you and your concerns. You want someone that’s open to thinking outside of the box and who understands that you may not fit in with the standard of care. It's a good idea to ask some standard questions when contacting a new doctor for the first time. Something else to consider is you can work with a functional doctor remotely, via Skype. You could also contact your local pharmacist or compounding pharmacy, who may be able to point you to a local doctor who has a natural functional approach. But I encourage you to keep looking for the right one for you! Here are some resources you might find helpful. I just received your book and have hit the ground running with the liver protocol. So desperate to see results and hoping your protocols are the answer!! Have you seen patients have issues with thyroid when taking Trazadone?? I’ve noticed my symptoms have gotten progressively worse since my initial diagnosis (1 year ago) but that is also the same time I was put on trazadone. I use it as a sleep aid but have noticed rapid hair loss and significant change in texture since. Along with hair loss, I feel like my anxiety has worsened. I can’t ever remember feeling this nervous/anxious. Wondering if this is possibly a side effect or if this is just classic Hashimotos thyroiditis? Thank you for a really interesting article. I took Roaccutane over 30 years ago. My acne disappeared, but so did all of my energy! I have never recovered from this medicine. You mention genetically susceptible persons. Could you tell which SNP`s that doesn`t work well with Roaccutane? I suspect MTHFR. Thought I saw a newsletter from you in august 2018 regarding this topic, but now I can`t find it. Please help! Hello, I have hypothyroidism since my menstruation stopped, 13 years ago. After reading your book (thank you) I tested Hashimoto and I do have the antibodies.When I had shingles, the doctor prescribed GABAPENTIN. Around 8 years ago I took it for 6 month and I slept much longer and better. Now I’m taking it again, my doctor prescribed it for sleeping better, because I’m not sleeping well. My question is: IS GABAPENTIN bad for my condition? I did a search on Google with your name and gabapentin, but although it comes out in Google. it refers it to your site, and it’s very hard to find any reference to it. I couldn’t find any. Thank you for your work and for reading this question. Rita – thank you so much for reaching out and sharing your journey. I appreciate you support and the big hug! <3 That's a great question and unfortunately I don't have any information to share with you at this time. Each person will react differently. I highly recommend that you work with a functional medicine clinician to be a part of your own health care team. It’s an entire medical specialty dedicated to finding and treating underlying root causes and prevent serious chronic disease rather than treating individual disease symptoms. I believe that everyone needs to find a practitioner that will let him/her be a part of the healthcare team. You want someone that can guide you, that will also listen to you and your concerns. You want someone that’s open to thinking outside of the box and who understands that you may not fit in with the standard of care. It's a good idea to ask some standard questions when contacting a new doctor for the first time. Something else to consider is you can work with a functional doctor remotely, via Skype. You could also contact your local pharmacist or compounding pharmacy, who may be able to point you to a local doctor who has a natural functional approach. I encourage you to keep looking for the right one for you! Here are some resources you might find helpful. Meredith – thank you for reaching out. I wish I could give you more direct advice but, each person will react differently. I would advise you to discuss this and share your concerns with your trusted clinician who’s care you are under. Hi, Dr. Went. Thank you for your information. This is the first time I’ve encountered you or your work, so I’m a bit overwhelmed. I was diagnosed with hypothyroidism several years ago, and Fibromyalgia and chronic fatigue in 1995. I’m positive that the only blood tests ever run were for TSH. What other tests would you recommend that I ask my PCP to run to see if it could be Hashimoto’s? I used to be chronically cold, but two years ago it was like somebody flipped a switch and now I am almost constantly to hot. I’m not very familiar with the other symptoms, other than my hair is very thin, fine, and, if I don’t wash it daily, oily, but my mucosal membranes are dry. I’d appreciate any input you can give me. P.S. I have an allergy to iodine. How would this affect things? Thank you for your time and information. Really great article. Learned more here than from my endocrinologist that has never, ever discussed food or medication interference. I am very athletic and seem to get athletic’s foot several times a year. I have seen some random writings regarding over-the-counter fungal creams for athletic foot being bad for those of use that are diagnosed with hypothyroidism. Somehow the anti-fungal cream interferes with the synthroid medication. Looking for an accurate answer before continuing my use of the over-the-counter products for athletes foot. Charlene – thank you so much for following this page! <3 That's a great question and unfortunately I don't have any information to share with you at this time but, I will add this to my list of future article possibilities. I would advise you to discuss the use of this product and your thyroid medication with pharmacist or practitioner.